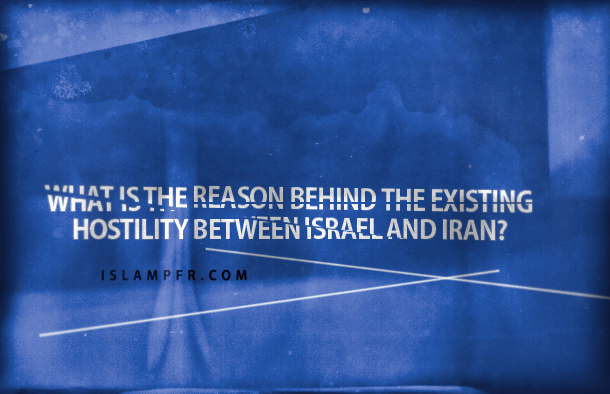 What is the reason behind the existing hostility between Israel and Iran? In order to better understand the reasons behind the existing hostility between Israel and Iran, first we need to know their beliefs and ideologies. Iran is a Muslim (Shia) country. Shiism is a sect of Islam which in a simple word, believes in the leadership and follows the successors whom the Prophet of Islam determined after himself. The successors of the Prophet whom begin with the Prophet`s son-in-law, Imam Ali (PBUH) as the first Imam of Shias and continues till the 12th Successor whose name is Imam Mahdi (PBUH), the savior of Final Era and has been promised in divine holy books. His name is Mahdi and will return jointly with Jesus (PBUH) in order to establish peace and justice at Final Era. Since Shia follows Imams and the tradition of the Prophet of Islam, therefore; one of the Shias` characteristics is that they confront any oppression wherever it occurs as their Imams were always fighting and standing against tyranny and injustice. For example, 3rd Imam of Shias, Imam Hussein (PBUH), sacrificed not only his own life but also his family`s, children`s and companions` lives to stand against cruelty. Additionally, Shias believe that all of us are human and equal; all of us deserve peace and tranquility. Therefore; when a nation is oppressed, we as human and brothers must fight against tyranny even if the oppressed nation is not from our own race, religion or language. Now let’s examine the ideology of Israel. Israel is a Zionist regime. Briefly speaking, Zionists are the deviated Jews whose main targets and aims are confiscation of money and power in order to rule the world. Moreover; Zionists believe that any mean is justified if it leads to their ends and they remove their barriers in any possible way. Based on this viewpoint, Zionists have seized the home of the Palestinians and forced them out of their homes. And whoever from the Palestinians who wants to protect his homeland, shall be killed. To rule the world, Israel does everything including infanticide, genocide, waging war in the other countries, distorting the religious beliefs and any other actions which destroys other nations or make them slave and obedient. Therefore; Israel is an obvious oppression. As we said already; out of humanity, Shias never consort with the oppressor and always stand against its cruelty. Therefore; these two (Iran and Israel) cannot be friends. Another reason for the hostility between Israel and Iran is the problems which Israel creates for Iran. Assassination of the Iranian scientists and elites, US sanctions against Iran, incitement of other countries to attack Iran, propagation of lies about Iran and Shias by media and also creation of economical, social and cultural problems, all of which are triggered by Zionists and it is provable based on evidences and documents. In fact, Iran has problem with the Zionism ideology which is nothing but massacre and violation of other people’s rights while Israel regime is the manifest of this ideology. You may read more about Zionism in this website and get notified of their negative impacts on the world.